A recent Facebook post showed a way to divide that the individual said “made no sense” to her. Others weighed in with similar comments, saying they learned division differently. They didn’t say whether they could still divide. The complaints were leveled at Common Core, which now is to blame for everything wrong in education the way Mr. Obama is to blame for everything wrong in America. Teachers are now getting on the bandwagon, in some instances bragging how many children are opting out of the test. Before I tackle that problem, let me address this division problem, for there are several ways to do it. First, if one doubles 2460 to get 4920, and divides by 10 (doubling both divisor and dividend doesn’t change the answer), one gets 492. That is how I would do it in my head. Here, one is breaking down 2460 into numbers easily divisible by 5; namely, 2000, 400, and 60, and adding them. Same answer. This would be my second choice. As for parents not being able to do their child’s homework, my father, a science teacher, wasn’t able to help me with my geometry homework, either. 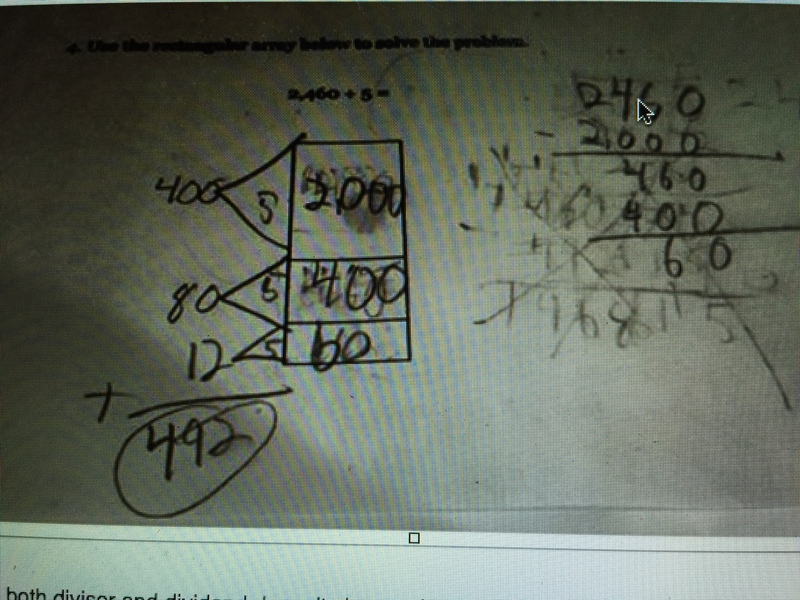 That’s not common core; it’s the fact that over time we forget how to do things. If one learned how to divide but no longer can do it, with brief practice, one could again do it well. I re-learned calculus 32 years after I took it. I wasn’t brilliant, but I had once learned the concept. When I saw it again, and saw the instructions, my ability once again returned. One good comment posted was “how do you divide by 7?” I answered that in my response to the original post. Suppose we want to divide 7 into 3817: I break 3817 into 3500 +280 +37. If I divide 7 into each of the three dividends, I get 500 +40 +5 remainder 2, or 545 2/7. The issue with Common Core, just like No Child Left Behind, from the “Education President,” is that American children as a whole are not doing well in math and other subjects, lagging behind the rest of the world. The rise of charter schools, the decline of public schools, the lack of funding for the latter, while we are building prisons and cutting taxes for upper income earners and businesses are all contributing factors. The public also demands accountability. That is fine. The response has been to create various forms of testing to prove competence. After all, at some point in the educational process, somebody needs to be proven competent. How one proves such without testing I do not know; proof of knowledge has traditionally required showing one’s ability to do something, and I call that a test. The fact a student may be nice, easy to talk to, gets along with others, gives hugs, or helps out at home or in the community is fine, but I want more from my mechanic, doctor or pilot. I like hearing a friendly voice at Dutch Brothers. I also want them to make change properly and serve drinks with safe water and safe ingredients. I want my automobile properly engineered so it doesn’t break down and the seat belts and air bags work. I want the dam up river to be constructed so it doesn’t break, which it did a while back, and lack of attention to prior broken parts caused the one of the sluices to be left open, because the motor at the time couldn’t be trusted. We often don’t see the results of competence first hand, so we tend to disparage tests; we do, however, see the results of lack of competence. Arizona had the AIMS test, testing English, math, and science. The problem with AIMS was that not surprisingly, many students failed it. If they failed it too often, they didn’t graduate. A child’s not graduating from high school upset parents and others, because for years, children had been passed on up the line to graduation, leaving high school with the inability to do math, speak well, know geography, history, including American history, and ability to write properly. But they graduated. Eighty per cent failed the local community college’s math placement test. I tutored for years in an affluent high school where students in the 10th-12th grade worked on simple arithmetic problems at the third grade level, all along being allowed to listen to music. When I objected, stating music was a distraction, the students said they needed music to perform. I then asked why they were in the class in the first place, since their performance to date hadn’t been acceptable. The school allowed music to be listened to; I thought that a bad idea. I often wonder what these students are doing now. AIMS became watered down, so that as long as a student had a decent GPA, they could graduate without it. Finally, AIMS disappeared altogether. In its place, we have new national standards. I am not saying I agree with what is on the test, and I don’t agree teachers should teach to the test. They shouldn’t have to. Too often, math tests are written by those who want to show how clever they are. I think we might well do better with at least two tiers of math, one for those who are likely to go to less intensive (regarding math) fields, and the other for those who are going to college and need a certain degree of math to continue. Germany tests its students earlier in their educational career; it is clear that some should not go to college but belong in other careers, important to society, a better fit for the student, but without the math that is needed for higher level education. I might require basic statistics, so that students would understand something about sampling, margin of error, mean-median difference, how to make and read a graph, and how to count things that matter. Like it or not, people need to learn how to add, subtract, multiply and divide. They absolutely need to memorize the multiplication tables, and eventually multiplication will become automatic. They need to be able to use calculators but also understand when a calculator’s answer makes no sense. Students must show knowledge of math for a given grade before they are promoted, the proof being one with which any reasonable adult would agree. Some high school diplomas will not contain the same words as those for students who took four years of high school math. Parents need to fish or cut bait. If we want children to be properly educated for the 21st century, then we need to prove it. It is distressing to see and hear both parents and teachers alike complain about Common Core unless they are developing alternatives. I’m open to suggestions; I’m not open to continuing to pass students along to the next level, delaying the day of reckoning. That day has long come. This entry was posted on May 8, 2015 at 14:39 and is filed under Uncategorized. You can follow any responses to this entry through the RSS 2.0 feed. You can leave a response, or trackback from your own site.